an explanation that the purpose of the research, the study procedures and the other required elements in the consent form will be presented to the subject, or legally authorized representative in their preferred language. Short form consent documents (that satisfy the Pre-2018 Common Rule Requirements) in some languages are already available on Short Form Consent Forms. If you are using one of these forms, then there is no need to submit the specific short form documents to the IRB. If you are creating a new short form document, then it must be submitted to the IRB along with a certification of translation prior to use. The translation should be based on the English version of the short form document. A signature section with signature lines for the person obtaining consent and for the witness. A person who orally presents the summary document to the subject or their legally authorized representative, and translates the consent conversations. This can be the person obtaining consent. 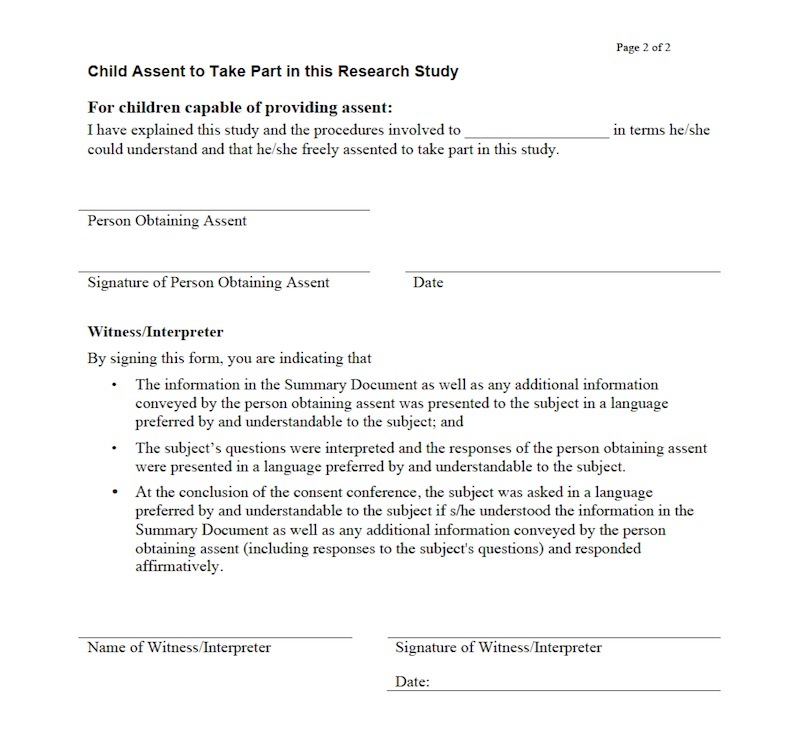 If it is the person obtaining consent, a second individual (who is not part of the study team or otherwise involved with the study) must serve as the witness. An adult family member (who is not the legally authorized representative), e.g. an aunt, uncle, or older sibling, can serve as an interpreter and witness. A person that (a) understands both English and the subject's preferred language and (b) is not part of the study team or otherwise involved with the study, and witnesses the consent process. This can be an interpreter assisting the person obtaining consent. How does the short form consent process work? The investigator presents the consent information to the subject (parent/guardian) using an interpreter. The interpreter must be fluent in both English and the preferred language of the subject (parent/guardian) and may serve as the witness, provided that they are not otherwise involved in the study. Consent is then documented on both a Short Form Consent form in the subject's preferred language and on a Study Summary Document. The interpreter must be fluent in both English and the preferred language of the subject (parent/guardian). When the investigator presents the consent information to the subject (parent/guardian) the interpreter presents the information in the subject's (parent/guardian) preferred language. Either the interpreter or a second individual (fluent in both languages) can serve as the witness. The witness cannot be otherwise involved in the study. The witness can be a family member, friend, a clinic nurse who is not involved in the study, or anyone 18 years or older. The subject's questions were interpreted and the responses of the person obtaining consent were presented in a language preferred by and understandable to the subject. 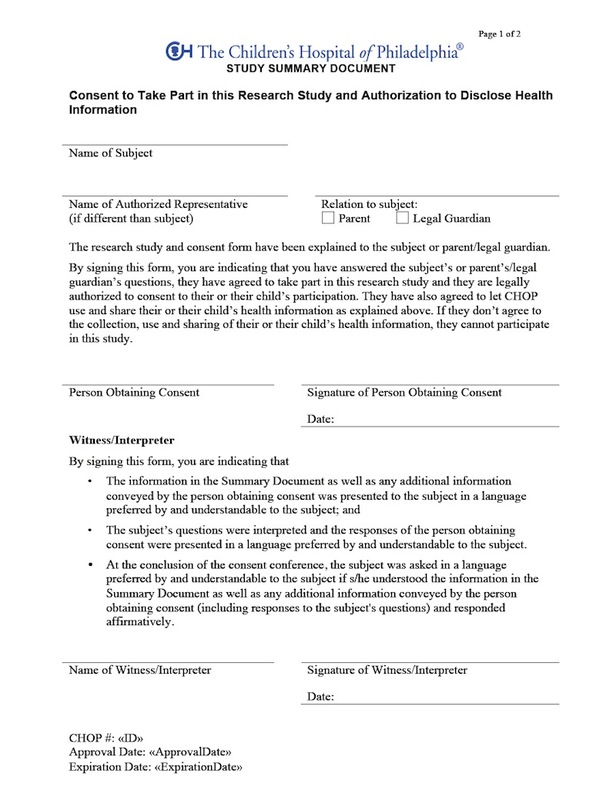 At the conclusion of the consent conference, the subject was asked in a language preferred by and understandable to the subject if s/he understood the information in the Summary Document as well as any additional information conveyed by the person obtaining consent (including responses to the subject's questions) and responded affirmatively. Only two changes are needed to convert a consent form into a Summary Document. 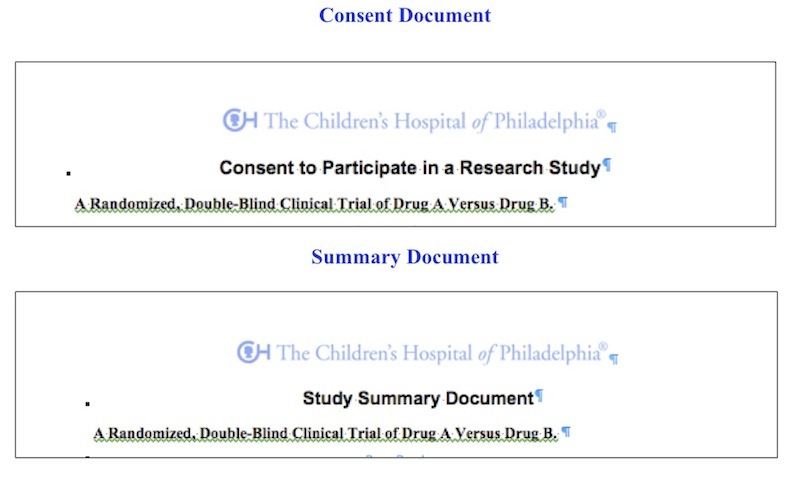 The title of the informed consent document header should be changed to Study Summary Document. The signature page needs to be revised. Only the investigator and the witness sign the signature page of the Summary Document.